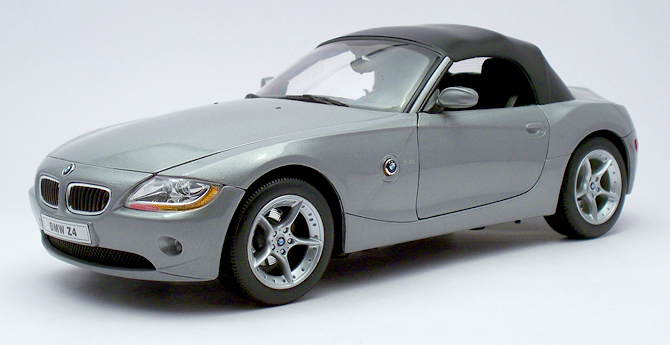 The Z4 is a rear-wheel drive sports car by BMW to replace the Z3. 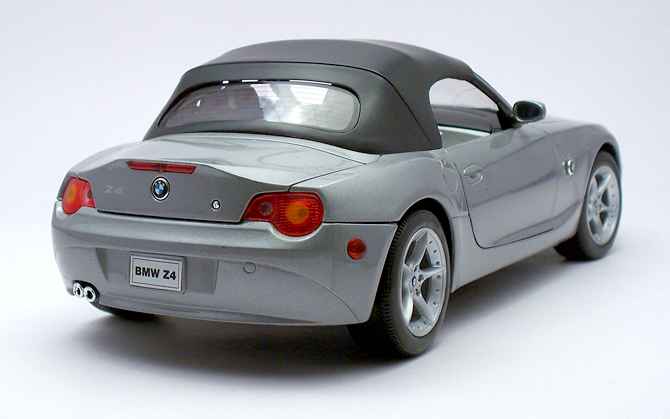 The first-generation BMW Z4(E85) was designated the E85 in roadster form and E86 in coupé form. It was designed by Danish BMW-designer Anders Warming. The 2003 Z4 Roadster is available as a 3.0i, 3.0si, 2.5si, 2.2i, and 2.0i trims in varying engine capacity and power output. The Z4 coupé is available only in the high-performance 3.0si trim. 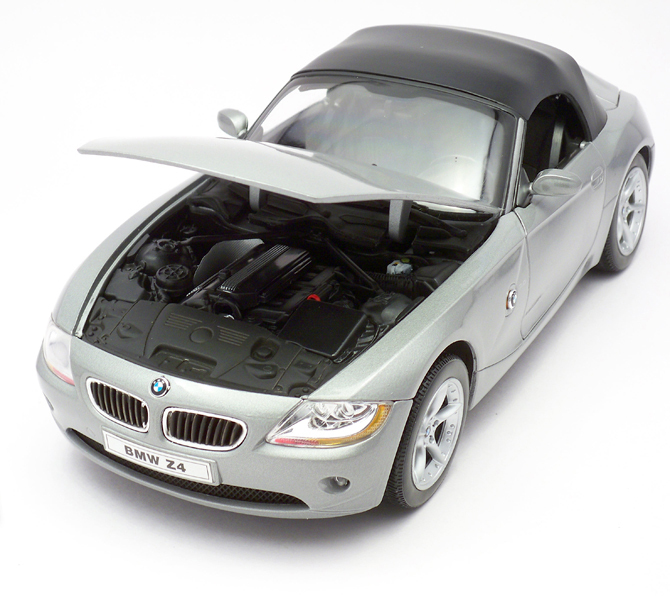 Most diecast model maker including premium brands like AUTOart make convertible version with the top down, though Kyosho makes some nice soft top versions which are even removable! 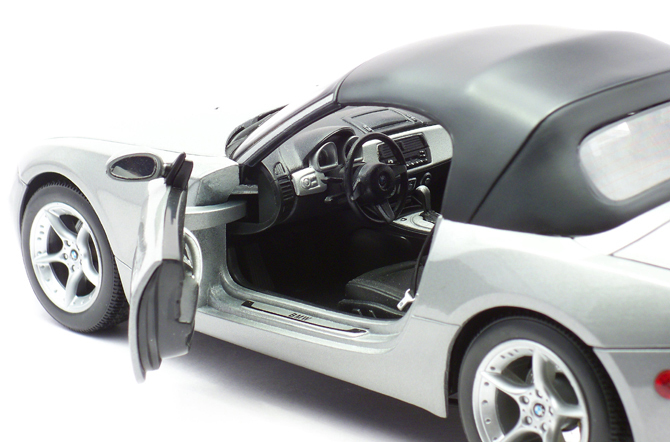 The case is different with budget brands but one brand named “WELLY” stands out to make both soft top and top down version in their lineup which includes BMW Z4, Audi TT, Porsche Boxster S etc. 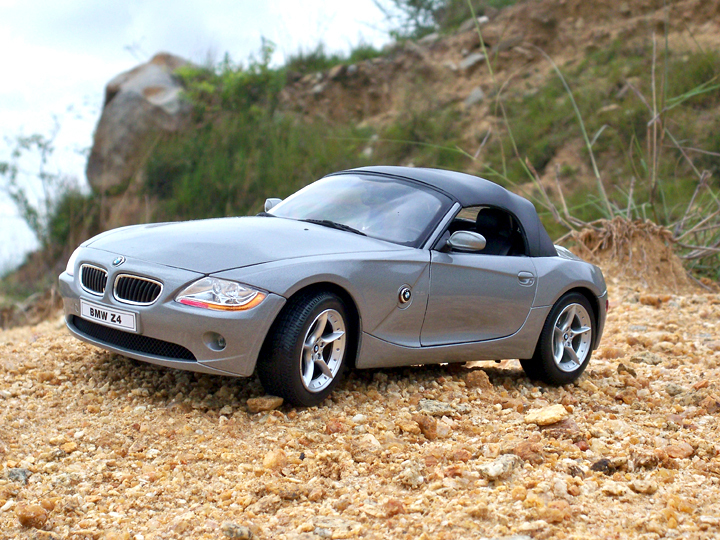 We have here one such car the BMW Z4 (E85). Let’s see how it stacks up with other model from Welly? 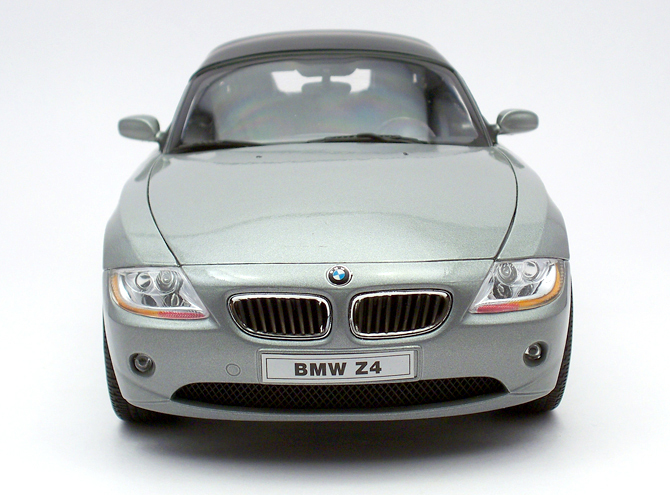 This Z4 3.0i diecast model strikes a perfect balance between value and aesthetic. The dimension is proportional, body work is clean and swooping, paint job great. The tire and alloy wheels have some great details which includes the BMW logo, five bolt and drill like pattern, but sadly the brake disc is too chromy as opposed to the real car. Though the soft top look plasticky, the contours and curves on it are well maintained. It is not a removable soft top, being a budget model asking for such option would be too much. One suggestion to Welly would be to reduce the size of the bottom holding slots as they are so big and visible even from distance. The door hinges are chunky and are Welly’s default. The interior is all plastic affairs but the dual tone is very striking which is enhanced by the door sill plate. The gear stick is chunky and detailed. The seats though made of plastic looks leatherish, Welly has given a special textured finish to the seats which makes it look like leather seats. The seatbelts look oversized but the chrome like buckle looks nice on it. The door treatment is also spot on which even include a chrome plated handle. 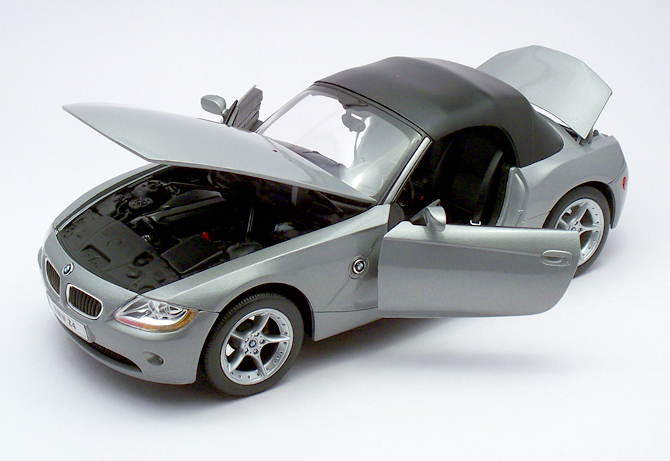 This Z4 oozes with all generic features like operational doors, boot, hood steering and functional suspensions. The radio reception antenna at the rear is missing! Which leaves me with a question whether this model (3.0i) comes with one or not! The engine is not so detailed and looks quite blunt because the original car also has a all black bay with very minute aluminum touches to show more purposeful look. This is the my first BMW because I am a very diehard fan of this brand! For me detailing is more important so stayed back from BMW models because most budget model have poor quality or they are available in non impressing color like a red Z3 made by Maisto which give you a feeling of owning a toy than a scale model. Finally this model crossed me and its love at first site. Well yes your collection is damn neat…..
Nope… the soft-top is fixed! I dint get it off the store! A forum(http://www.scalemodelcarz.com/enter) friend of Sidd got this for me. 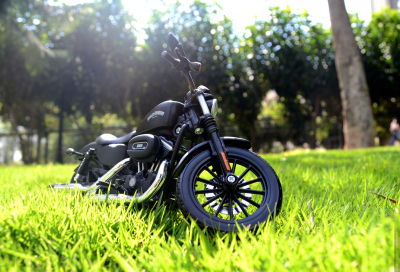 I personally havn’t seen this in any of the stores here in India, even I am waiting for the roadster version to go with the soft-top. 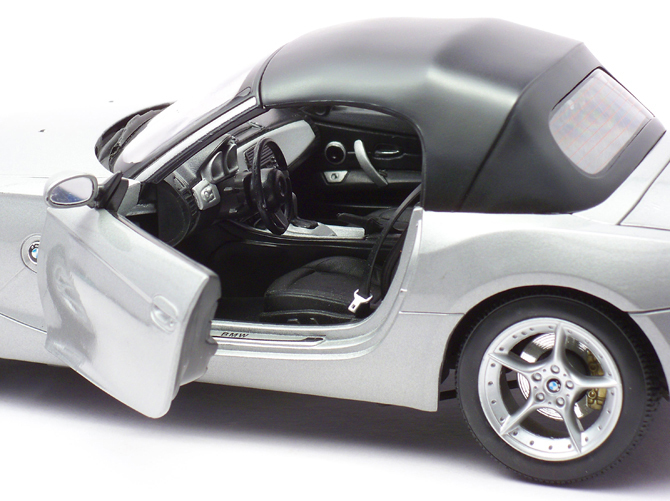 A tip though: Automania has a Kyosho Z4 Coupe in silver which costs Rs.4409/- take a look at it, You may fall in love with it.